The U.S. is putting on display its military might for North Korea. American bombers and fighter escorts have flown to the farthest point north of the border between North and South Korea by any such U.S. aircraft this century. North Korea’s leader, Kim Jong Un, has said Trump would “pay dearly” for threatening to “totally destroy” North Korea if the U.S. was forced to defend itself or its allies against a North Korean attack. The Pentagon says B-1B bombers from Guam and F-15 fighter escorts from Okinawa, Japan, have flown a mission in international airspace over the waters east of North Korea. The U.S. says it’s the farthest north of the Demilitarized Zone that divides the Korean Peninsula that any American fighter or bomber has flown this century. 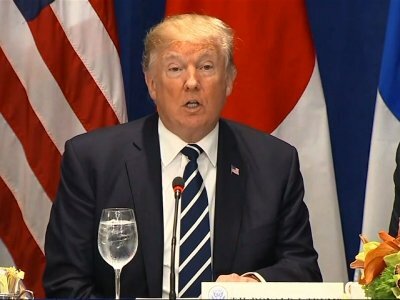 President Donald Trump has threatened to “totally destroy” North Korea if the United States was forced to defend itself or its allies against a North Korean attack. As with much that has transpired lately in the U.S.-North Korea nuclear crisis, no one can be sure where this would lead or whether the North will even carry out its threat. It does raise many questions, including how would the North undertake such a nuclear test, what risks might it pose to Japan and how would the U.S. respond?